Chipzilla may not raise its dividend this year. There are several reasons why that might be the case. On Jan. 23, microprocessor giant Intel (NASDAQ:INTC) announced a quarterly dividend of $0.26 per share, which will be paid out on March 1 to stockholders of record on Feb. 7. Intel had paid a quarterly dividend of $0.26 per share for the past four quarters, so there was some expectation that the chipmaker would boost its dividend this time around. In fact, about a month ago, I wrote that I expected a "modest increase" in the company's dividend. The lack of a dividend increase could give us some insight into Intel's thinking around its cash generation and use during 2017. Why keep the dividend flat? At $1.04 per share, at a share count of approximately 4.74 billion, Intel is paying out roughly $5 billion in dividends per year. Over the past 12 months, Intel has generated about $10.54 billion in free cash flow, meaning that the company is already returning a significant portion of its free cash flow in the form of the dividend. There are a several reasons for Intel's keeping the dividend flat for, potentially, the entirety of 2017. The first may simply be that the company was already "running hot" in terms of the percentage of its free cash flow that it allocated to the dividend. 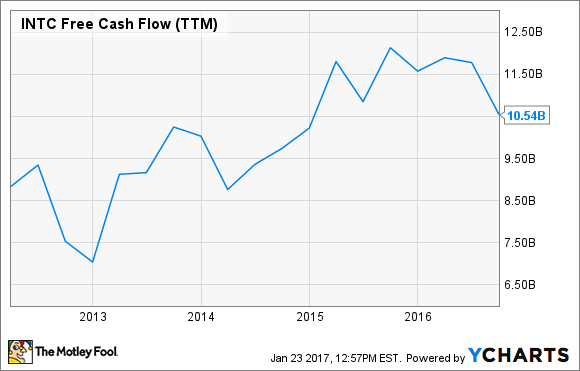 So by not increasing the dividend this year -- even if the company expects to generate more free cash flow in 2017 than it did in 2016 -- Intel may simply be trying to reduce how much of its free cash flow goes to the dividend. The next, and perhaps the most pessimistic, of the explanations is that Intel is expecting to see free cash flow stay flat or even decline over the next year. This wouldn't necessarily mean Intel is expecting its business to crater, although such an expectation could mean reduced free cash flow. However, if the company expects to, say, spend substantially more on semiconductor capital equipment for its factories this year than it did in 2016 without a correspondingly large or larger improvement in operating cash flow, then free cash flow could decline. And, finally, Intel may simply be planning a very big use of cash, perhaps in the form of a large acquisition. If Intel goes out and, say, spends $10 billion or more to buy a company, then the company is going to need to take on debt to finance such an acquisition. Then, since Intel's goal is to keep its balance sheet largely net-debt neutral, it would likely want to redirect free cash flow not committed to the dividend toward getting that debt paid off as quickly as possible. It's hard to read too much into Intel's thinking about the future from this lack of dividend increase, given the several potential explanations for it. However, investors won't have to wait too long to find out what Intel's expectations around its business performance in 2017 are as the company should go into that in excruciating detail at its Feb. 9 investor meeting.